THE CROWN PROSECUTION Service has determined that Conservative Party candidates will not face criminal charges in relation to breaches of expenses rules during campaigning for the 2015 general election. The case centered on whether these candidates broke the law by recording money spent on busloads of party activists sent to key areas as part of the party’s national spending, as opposed to the more limited local budgets. In March, the elections watchdog issued the Conservatives with its largest ever fine – £70,000 (€80,000) – for misreporting expenses for the 2015 general election and three by-elections in 2014. Despite this, however, the CPS has decided that the Tories will not face criminal charges. Nick Vamos, head of special crime at the CPS, said: “It is an offence to knowingly make a false declaration. In order to bring a charge, it must be proved that a suspect knew the return was inaccurate and acted dishonestly in signing the declaration. Although there is evidence to suggest the returns may have been inaccurate, there is insufficient evidence to prove to the criminal standard that any candidate or agent was dishonest. Vamos acknowledged that, as it was “clear agents were told by Conservative Party headquarters that the costs were part of the national campaign”, it would not be possible to prove any one person acted knowingly or dishonestly. One file, received by Kent Police separately but on the same matter, is still under consideration. While Theresa May has said the decision not to pursue charges demonstrates the candidates had done nothing wrong, opposition leaders on the campaign trail ahead of next month’s general election attacked the Conservatives today. Labour leader Jeremy Corbyn said he was “surprised” by the result. Liberal Democrat leader Tim Farron, meanwhile, said that while the Conservatives had stayed “on the right side of the law”, they had “driven a battlebus and horses right the way through the spirit of it”. Notwithstanding the fact the CPS say there is not the evidence, the high bar of evidence, to prove criminal intent, there are lots to suggest that the Tories were “at it” when it came to how they were allocating election expenses in some constituencies. Conservative party chairman Patrick McLoughlin welcomed the outcome, saying the allegations were “politically motivated and unfounded”. “We are pleased that the legal authorities have confirmed what we believed was the case all along: that these Conservative candidates did nothing wrong,” he said. Email “'A cloud over British politics': Tories won't face criminal charges for Battlebus expenses”. 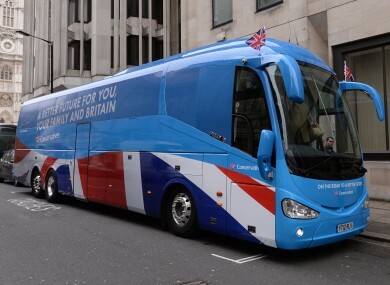 Feedback on “'A cloud over British politics': Tories won't face criminal charges for Battlebus expenses”.